Wedding music is the heart and soul of the celebration, and the repertoire deserves thoughtful and careful preparation. 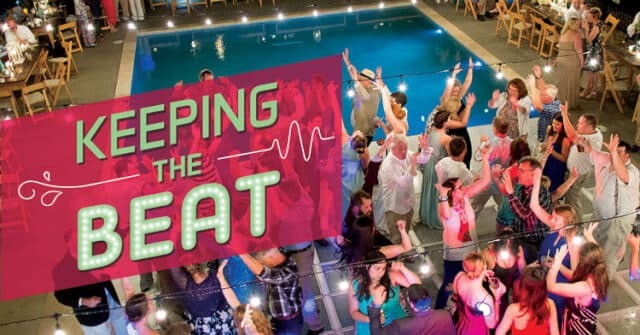 Selected songs must be carefully orchestrated to fit the mood of each part of the wedding: whether playing in the background, flowing seamlessly between the ceremony and the cocktail hour, or pumping up the dancers. From the recessional to the last dance, music is the soundtrack of your important day. Your guests start arriving at the site you’ve chosen for your ceremony. As they’re being seated, music floats among the whispers and soft laughter of the friends and family who are being seated in joyful anticipation of the marriage ceremony. As the family members are escorted down the aisle, the music becomes more distinctive, drawing the audience’s attention to the line of attendants making their entrance. Then with a dramatic change in the music, all eyes move to the bride who is making her grand entrance. Music is played at selective times during the marriage ceremony and then as the newly joined couple begins their wedding march. Most weddings follow this basic music script for the ceremonial part of the wedding, give or take some personal touches. In general, classically trained musicians can be more expensive because of the high level of skill and education required. The pieces can require new arrangements and of course, many rehearsals. So although the musicians may be on the scene for a brief period, much preparation time is required before your wedding day. Live bands generally are less expensive – though they can be just as skilled as the classical players – but they cost more than a DJ. They may have a particular style of music or play a wide variety of genres. While their list isn’t always as far-reaching as that of a DJ, live bands usually are willing to attempt familiar songs on the spot. Typically a bandleader will ask the couple to choose songs from a set list, and the band picks from them during the reception. Professional DJs each have their own programming style that defines what they play and when. Thanks to digital music, most have a nearly limitless selection of music at their fingertips. A good DJ is familiar with a wide range of wedding event music. They are generally able to showcase the musical tastes of the bride and groom as well as play reliable crowd-pleasers that will get guests out on the dance floor. Some DJs also act as a Master of Ceremony and provide their own brand of entertainment. Be sure you ask about a DJs style to make sure it’s a good fit. Also inquire if they are up on the latest releases or have older favorites in their mix, if that’s your taste. The big variable is the venue: beach, backyard, or church? 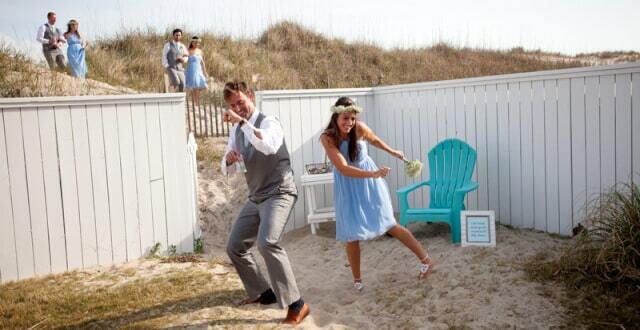 Despite the challenges, an outdoor Outer Banks wedding is often a dream come true. 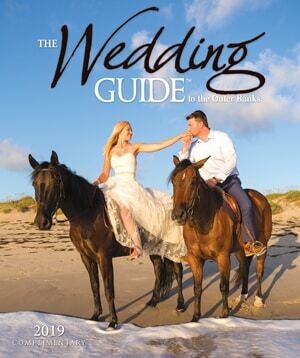 Couples choosing to marry here generally pick the casual beach wedding over a church setting. Depending on the setting, weather can be a huge factor in the quality of the music. Reed and stringed instruments, for instance, may not fare well in extreme temperatures or salt air. Vocals or instrumental music may be drowned out by noisy winds. Electrical equipment can be shorted out by rain or, heaven forbid, lightning. Even with nice weather, acoustics can be difficult to control outside. It is important to have a backup plan in the event of bad weather. 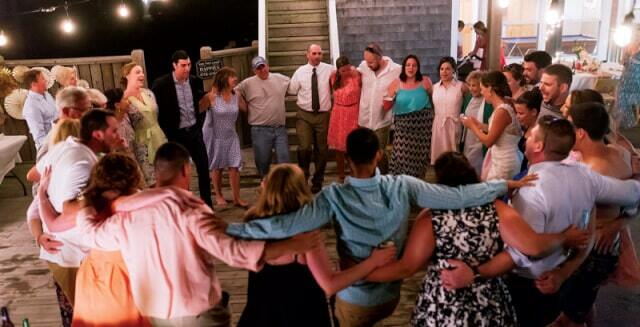 Local couples or those looking for church weddings may choose from many houses of worship of different denominations here on the Outer Banks. If the couple chooses a church wedding, they may have the option of hiring the in-house organist or using pre-recorded music. Wherever the venue, some couples like to provide their own music selections for the DJ. Typically, the couple selects the songs for the “first” dances. A bandleader or DJ often can help the couple pick out the appropriate first dance songs. Recent trends are leaning toward contemporary favorites such as “All of Me” by John Legend, “Grow Old With Me” by Tom Odell and “Marry Me” by Train. Of course, there are still the standard favorites like “Wonderful World” by Louis Armstrong and “My Girl” by the Temptations. If it is a live band, the band makes sure they all learn the chosen songs before the date. Many musicians also are very willing, usually for an additional fee, to arrange a new song provided by the bride. 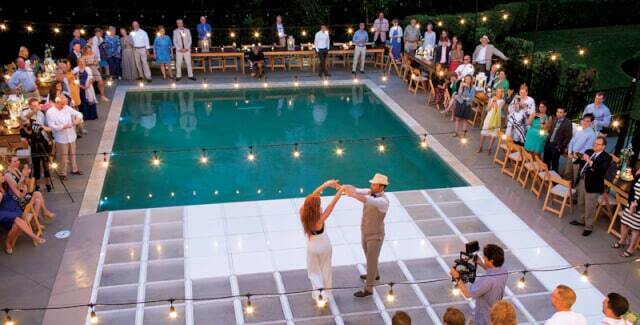 This is where the fun really steps up, and the couple can relax and join in the festivities without having to worry. If you want a festive wedding, it pays to hire a great band or DJ, who often serve as the glue for the party. Experienced bandleaders and DJs know to keep tabs on all the reception’s players – the caterer, the photographer, the family and the guests – to keep things rolling the way they should. Real pros know how to read the crowd and adapt the music accordingly. Ideally the music should inspire people to dance, both slow and fast, and adapt when the younger folks out number the older folks later on in the party. A last song chosen by the couple is a nice way to close a great gala and leave the guests with wonderful memories. • Not all song requests may be appropriate for the crowd or the mood. Respect the expertise of the professionals you have hired. • A “do not play” list can be restrictive. • It is not always possible to perform outside on the beach, especially in high wind and rain. Always have a backup plan in place for outdoor weddings. • Even if you are willing to pay for overtime, the venue may not allow it. Check ahead of time if you have the option of keeping the party going. • Happy guests make a great party, so always keep them in mind when choosing the music. • Trust the professionalism of the musicians or DJ in reading the crowd. • The more trained/experienced the musician, the more he or she is worth. • A phone or in-person consultation is much better than email in helping the entertainer get to know your taste and meet your expectations. • What is your musical specialty, background and experience? • Do you provide MC services during the reception? • Do you charge by the hour or the event? • Can you accompany vocalists? • What are your equipment, power, and space requirements? Have you played at this venue before? • Do you have a set list from which you work? Will you provide a copy? • Are you willing to learn special songs that are not on your set list? Is there an additional fee? • What is your policy on playing overtime? Is there an additional fee? • Are you open to taking requests from the wedding party and/or from guests? • What is your policy in bad weather? • Do you offer discounted rates on weekdays or off-season dates?